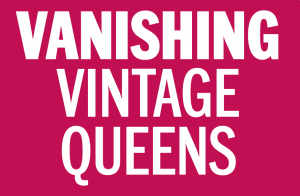 From February to March 2011, Nicholas Hirshon wrote a three-part series for the New York Daily News named “Vanishing Vintage Queens,” documenting the demise of middle-class hangouts such as diners and Masonic lodges in the New York City borough of Queens. But locals gripe that the deals are a poor substitute for what the Cavalier had provided – a place where friends met for the familiar faces and unique atmosphere that was a part of the community for half a century. Some refuse to patronize its discount replacement, still longing for the Cavalier’s neon signs and camaraderie. “I get a sinking feeling in my stomach,” said filmmaker Celeste Balducci, 53, who has lived in the area for nearly 25 years. The 99-cent shop doesn’t “add anything to the neighborhood – no personality, no charm,” she said. It’s a common refrain nowadays in Queens. The Unisphere symbolizes Queens, but the borough’s residents often feel more affection for the hangouts in their orbit of daily lives. In recent years, Queens has lost a startling set of haunts associated with its middle class, such as diners, ice cream parlors, movie houses and bowling alleys. The Daily News kicks off its Vanishing Vintage Queens series today to examine a trend that locals fear is fraying the civic fabric of the borough as the unique gives way to the generic. In coming weeks, The News will profile some storied places that have disappeared in the last decade. When locals lose sites that defined their neighborhoods, experts contend, their sense of place drops. “It’s that feeling that you belong,” said Marci Reaven of Place Matters, which builds an online inventory of not only the city’s traditional historic places but also its beloved stomping grounds. Neighborhoods are always evolving, inevitably leading to closures of some institutions. In Queens, some fell victim to market forces and rent hikes. Others waned in popularity as the borough became more diverse and new immigrants created their own hot spots. The transformations aren’t all negative. Queens has gained many ethnic eateries, for example, that have become the pride of their communities. 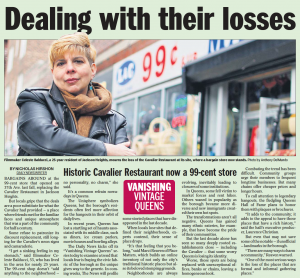 But the last decade alone has seen so many deeply rooted establishments close – including the Cavalier – that some worry Queens is losing its identity. Worse, those spots are being replaced with unexceptional offices, banks or chains, leaving a homogeneous look. Combating the trend has been difficult. Community groups urge their members to frequent longtime businesses. But many chains offer cheaper prices and longer hours. To call attention to legendary hangouts, the fledgling Queens Hall of Fame plans to honor them with plaques or brochures. “It adds to the community, it adds to the appeal to have those places that have a rich history,” said the hall’s executive producer, Laurence Christian. Six years ago, the German restaurant Niederstein’s still served platefuls of bratwurst and Wiener schnitzel for its hungry faithful in Middle Village. Today, a cowboy hat outlined in red marks the spot where Niederstein’s stood on Metropolitan Ave., welcoming visitors to its fast-food successor, Arby’s. Longtime residents still shudder when recounting the loss of the 150-year-old local institution after its purchase by Arby’s and demolition in 2005. Locals say the exit of Niederstein’s – where generations gripped beer mugs while celebrating birthdays and weddings – symbolizes about a decade’s worth of lost working-class hangouts in Queens. The restaurant became a popular stop after funerals, too, given its proximity to multiple cemeteries. But it met its demise after a co-owner died. His slice of the property passed onto his estate and the land was eventually sold. Author Jason Antos, who documented the transition in his 2009 book “Queens: Then & Now,” said Niederstein’s brought locals together for unique fare – whereas Arby’s does not distinguish the area. The familiar names once beckoned customers across Queens on buzzing neon signs: the Bayside, the Fame, the Scobee and the Future. The comfy atmosphere at these diners lured locals to their favorite booths, oversize menus and kitschy memorabilia on the walls. Not anymore. Those four diners are among many to close in the borough in recent years – an indication, some fear, that the distinctive gathering spots are disappearing from Queens. And it’s not just diners. Locals worry the borough is losing traditional middle-class hangouts that once provided a sense of place. Now in its second installment, the Vanishing Vintage Queens series is exploring the loss of communal spots such as ice cream parlors, movie houses and bowling alleys. Some feel the demise of those unofficial landmarks has diminished local civic pride. Michael Engle, co-author of the 2008 book “Diners of New York,” said the social lives of many residents seem to “die” after a local joint closes. But nowadays they struggle to survive. Among casualties last year were the Bayside, the Fame in Jamaica and the Scobee in Little Neck. Also troubling to community groups is that many properties lie vacant for months after a diner closes – or turn into a generic chain. A Hooters replaced the Future Diner, a popular date spot near the Fresh Meadows movie theater that closed in 2005. That has left a nostalgia for the “comfort factor that went beyond the comfort food,” said Richard Gutman, director of the Culinary Arts Museum in Rhode Island. Experts trace the downfall of Queens diners in large part to a ravenous real estate market in which the typical diner plot – a sprawling structure with a parking lot – makes landlords salivate. Deep-pocketed banks or chains are enthralled by the large square footage in dense New York City, offering a rent that most diners can’t match. 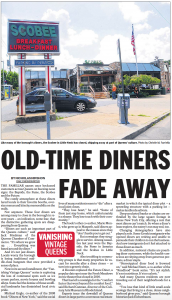 So when a diner’s lease expires, the eatery’s run may end, too. Changing demographics have also played a role. Some Greek immigrants who opened diners are retiring and unable to persuade their children to run the business. And new immigrants don’t feel attached to those diners as much. In addition, national chains are poaching diner customers, while the health-conscious are shying away from generous portions, a diner staple. And many Queens residents are now traveling out of their neighborhoods for a bite. “You lose that kind of little small-scale ecology that living in a close, dense neighborhood gives you,” said Queens borough historian Jack Eichenbaum. When Barbara Fortuna passes the TD Bank in Fresh Meadows, she remembers the site’s prior occupant, the Hilltop Diner, a 60-year mainstay whose booths bustled with regulars until it closed in 2005. The daughter of the Hilltop’s co-founder, Fortuna grew up inside the Union Turnpike hangout, where she always ordered chicken noodle soup, a roast beef sandwich and fresh mashed potatoes for dinner. Part of the property passed on to Fortuna. And six years ago, amid a messy dispute with the diner’s latest owners, she decided to lease instead to the bank. Residents bemoan the shuttering of the Hilltop, a popular gathering place for St. John’s University students, as part of a trend of disappearing diners in Queens. After the Hilltop’s departure, fast-food chains popped up nearby. But despite the competition, a new diner, the Corner Stone, opened a month ago in a small strip mall across 164th St. from the bank. Kevin Forrestal of the Hillcrest Estates Civic Association declined to predict the Corner Stone’s fate. A bronze statue of an elk, now green due to decades of oxidation, stands guard in Elmhurst in front of a landmark commonly known as Elks Lodge No. 878. For generations, the clubhouse hosted charitable and social gatherings until the Elks, whose dwindling membership no longer warranted such a vast space, sold it to a church a few years ago. The Elks still meet next-door at a smaller facility. But many point to the group’s exit from its Queens Blvd. base as a sign of a borough-wide downturn in fraternal organizations and service clubs. Once signatures of many tight-knit communities across Queens, groups such as the Elks – known for camaraderie and charity work – are struggling to lure new blood and hang on to meeting spots. “It’s quite a noble institution that has seen better days,” said Elks leader Lawrence Contratti, 67, of Long Island City. Elks aren’t alone. Other fraternal groups like the Masons are struggling, too, as are service clubs such as Kiwanis, Lions and Rotary. Locals fear that the weakening of such organizations diminishes civic pride, as does the demise of other middle-class institutions being profiled in the Vanishing Vintage Queens series. Members say many factors contribute to the woes of the groups, which rely on volunteers hoping to better their neighborhoods. Many immigrants – a large part of Queens’ population – don’t feel an attachment to the borough, and others are too busy to get involved. And as the ranks of members evaporate, so does the positive influence of a club in its community. “If we had twice as many members, we could raise twice as many dollars,” said Frances Scarantino, president of the Rotary Club of Southwest Queens.Fewer members mean a decrease in blood drives, food pantries and scholarships. “There’s just a range of little projects helping people in need that if they’re not being met by Lions or Rotary Clubs, they might go unmet,” said Peter Lynch, executive director of Lions Clubs International. “The fraternity got so comfortable and so large, and they just assumed everyone would join,” said Tabbert, also the collections director at the George Washington Masonic Memorial in Virginia. Optimists contend the groups are down but not out. Some members are calling on the city and state to make their dues tax-deductible and exempt the fraternal organizations from onerous real estate taxes. They all bemoan the trend of less community involvement. “Does it leave a void? I think inevitably it does,” said Skip L’Heureux of the Kiwanis Club of Richmond Hill-Woodhaven. Cutting through blocks of single-family homes in Forest Hills, Metropolitan Ave. embodies the main drags in small towns across the United States, thanks to a library, a post office and banks. That atmosphere was once also exemplified by the Masonic lodge – until troubled finances forced the owners to sell in 2000 to a bank that then razed the lodge for a parking lot. Gone is the meeting hall where Freemasons organized and hosted dances, dinners and charity events that signaled a civic pride many say is disappearing across Queens. All that remains is the lodge’s cornerstone, dated 1967, which was rescued by Jim Haddad, a Freemason who attended many functions there. He displays the memento in the yard of his Forest Hills Gardens home. Freemasons still meet locally, including at the American Legion hall just blocks from the old lodge on Metropolitan Ave. But membership is dwindling.